Cooking in someone else's kitchen: Summer? Today was the first day of summer. The garden furniture was retrieved from the barn and used for the first al fresco meal. Herbs and onions were harvested from the garden for a potato salad and the seed potatoes were planted in their trenches. Tree swallows are nesting in the martin house and, in the barn, an Eastern Kingbird* has taken over last year's barn swallow nest. 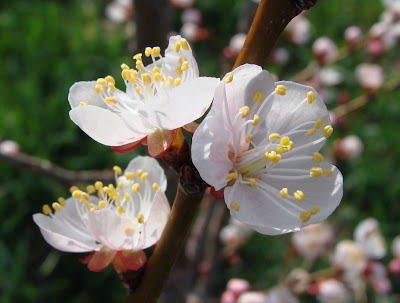 In the orchard, the apricot is in full blossom. It has been a wonderful day. *Also known by the rather unkind Latin name of Tyrannus tyrannus.